This is a very simple recipe that makes use of all parts of the duck (the meat, skin and bones). 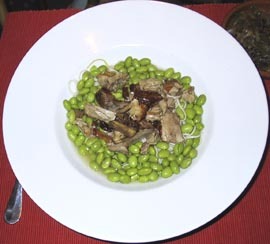 It uses frozen, shelled edamame (fresh soy beans) that you will find in the freezer section of grocery stores that carry Asian products, a BBQ'd Chinese duck that you buy at a Chinese market and any type of thin noodles (though a Japanese-type noodle give this dish a more Asian flavor). If you can't find shelled edamame or a Chinese-style BBQ'd duck in your area, this dish is probably not worth the effort to do from scratch (i.e. shelling edamame and barbequing a duck). But if you can readily find the ingredients, you can whip up a warming "East-meets-East" supper on a chilly Sunday evening. Remove the meat from the duck carcass. Place the duck bones and sliced ginger in a saucepan and add enough water to cover the bones (about 2 cups). Cover the pot, bring to a boil, then reduce to a simmer. Cook for about 30 minutes or until the broth develops a good duck flavor. Discard the duck bones and ginger and set the broth aside. While the broth is simmering, remove the duck skin from the meat. Shred the meat and set aside. Cut the skin into thin strips and place them in a shallow pan. Roast in the oven at 400� F for about 10 minutes or until the strips are dark and crispy. While the duck skins are crisping, cook the edamame in boiling water after about 10 minutes. Drain and set aside. Place a handful of cooked noodles in a warmed, shallow bowl. Cover the noodles with a cup of cooked edamame. Add enough very hot duck broth to make the edamame and noodles float in the bowl (about 1 cup). Top with duck meat and crispy duck skin.